What's the story behind Archetype forming? How and where did you find these guys? The Archetype team was born out of the community team who made Legions: Overdrive. We had about 5 or 6 of us when we started, and we've grown from there. Most people who join the team reach out to us because they're passionate about the genre and want to help. It's great to see so many people excited about Midair's vision who are willing to put the time in. It just goes to show that the kind of people who play games like Midair are a special breed both in and out of the game. With that said, we've had some churn over the years - usually people who underestimate the work it takes to build game in their free time or who just had their life change over the nearly 4-year course of development. I know personally I haven't had a "usual" week since we've started, and I don't think many on the team have either. It really is a testament to the team seeing how committed they are to making Midair a reality. After Kickstarter, we were able to bring on contractors and other full-time team members to help accelerate development, and I can't overstate how important that was. The team is now roughly 25 people with a mix of mostly volunteer and some paid members. It's hard to track down exactly who suggested it. It was more of an organic decision based off a lot of situational things that all came together at the same time. Originally we were going to make a 'Legions 2' based off Legions: Overdrive, but determined there were too many restrictions in both gameplay and the business to make that happen. We decided the best course of action if we were going to get serious about this was to make our own game/IP the way it needed to be done - all under our control. How long were you working on Midair before the Kickstarter? We got a lot of great early feedback that helped us craft the game over the next year and hunkered down to keep working on the game. The team changed a lot over the coming months. We grew and developed our skills, and it was starting to show off in the quality of what we were putting out. In early 2015 we launched the official, more fully featured website to start building the community around the game. 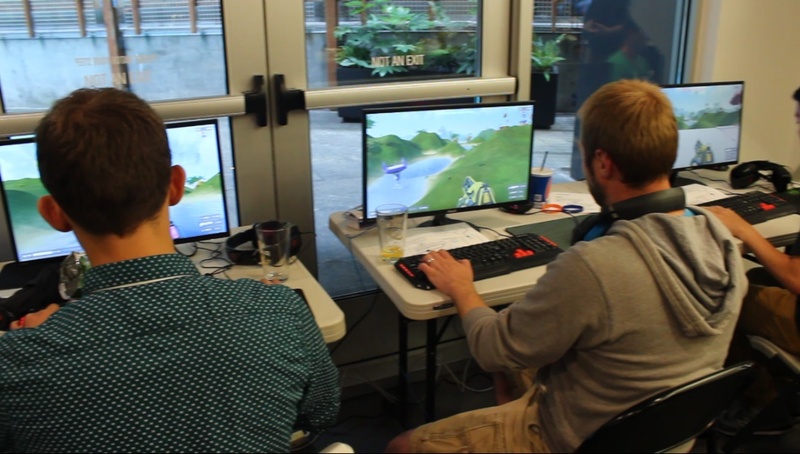 We just kept working on making the game better, and later in the year we officially named the game "Midair" and decided to run another community demo event nearby PAX (in the same place). By this point, the game was much further along and we got a great response. You can see in the picture how different it was compared to the previous year's demo. 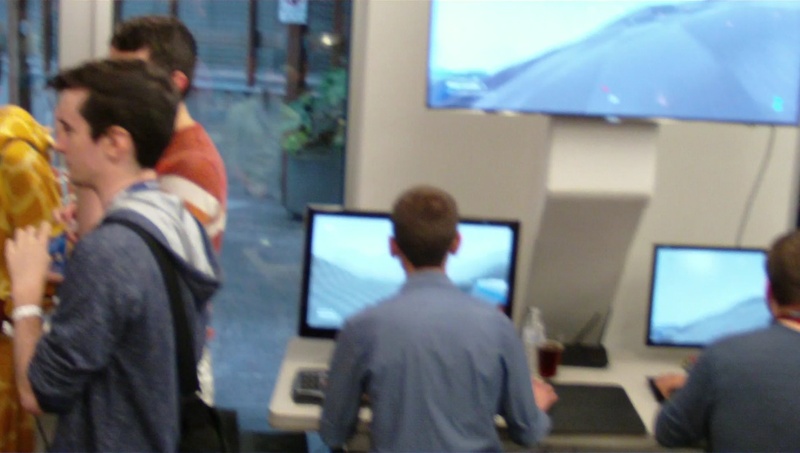 80 people showed up to play - double of the previous year. After 2 years it was a welcome event for the team. We hadn't put out much info yet and the excitement we saw around the game was encouraging. It's really tough to be heads down for nearly 2 years building something that relies so much on public opinion, especially since most people on the team were volunteering their time and energy. Everyone was relieved to see that we had been going in the right direction, and we had renewed motivation to push forward. After that event, we knew it was time to start moving forward with making Midair the real deal. Greenlight was next on the list, so we got our trailer ready and launched our campaign that Christmas. We were Greenlit in under 7 days - which is really fast especially considering the campaign ran during the holidays - which was super encouraging because now our game was finally in the open air with users who weren't already following the game, and they believed Midair and our vision was worth putting on Steam. The next step at this point for us was Kickstarter. It was going to be no easy undertaking, but we needed money to help us accelerate toward our launch, and a successful Kickstarter campaign would be hugely important in determining if players were willing to actually pay for what Midair would become. We worked hard…really hard for the next 6 months. I took off 2.5 weeks and used all of my vacation time to prep the Kickstarter and run it, as did others on the team. It still wouldn't be enough for the entire campaign, but at least we could get started with it. We launched the 30-day campaign in May 2016 with an ambitious goal of $100,000. We hit every news outlet we could find as much as we could, and we were ultimately picked up by PC Gamer, Kotaku, Rock Paper Shotgun, and more. With the press pickup and our awesome community (seriously, I haven't seen anyone spread the word like they did), we managed to blow past our goal and hit $128,000! That was an awesome feeling. Before and during the Kickstarter, people had worked so many late nights, so many 80 hour weeks leading up to this critical moment. And now had the capital to go make this thing a reality. So yeah we worked 3 years before our successful Kickstarter campaign. Was the Torque engine (made by former Dynamix devs) ever considered for Midair? What was it that made you use Unreal Engine? We did consider it. 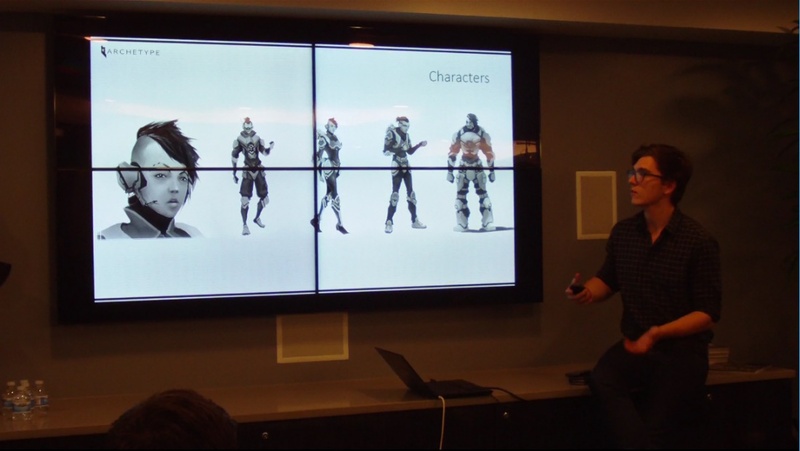 Legions: Overdrive was built on a custom Torque variant, but the engine was so far behind Unity and Unreal at the time. It isn't well known that we actually started on Unity before moving to Unreal. At the time we were running into a lot of issues, particularly with the art pipeline with Unity. We ended up moving to Unreal when it became free for indies (until revenue is made) because of their tool chain. It bought us hours per week back after the switch. Is there any history or connection between Archetype and the Tribes IP owners HiRez? What have they said about Midair? There isn't really a connection there. A former Legions: Overdrive and Tribes player (Adam/Apcizzle) was working as a community manager and then moved up the ranks there to do some really great things with Smite. He's moved on to bigger and better things now. We keep in touch and he's pretty excited about Midair. We've been in loose communication with some of the other developers on the team and they've always been really positive and encouraging. I believe they've all left HiRez now. What does an average team meeting at Archetype look like? How often do you guys meet? We have several meetings throughout the week. On Monday the art team meets. Tuesday is a regular design meeting followed by the code team. Thursdays there's a smaller art check-in meeting, a marketing check-in meeting, and we bring together all of the team leads for our weekly meeting. Sundays the marketing team meets for an hour or two for a work session. There are a few ad-hoc meetings that occur during the week, but what we have now keeps us well informed and moving a consistent pace. For the most part, no individual will have more than 2-3 meetings per week, which is really important when some of our volunteers only have 10-15 hours per week to give. I'm sort of the exception to the rule since I need to be available for questions that span each of the teams, so I usually attend about 4 per week (roughly 4-5 hours of my time weekly). What can you tell me about the decision process for what goes into the game and what doesn't? This is a tough one. Feedback is critical. There are a ton of points of feedback that we need to consider including community sources (Discord, forum, Twitter, Facebook, Discord, IRC, and other ad-hoc conversations), the Top User Issues board, new players that we sit down to try the game for the first time (I call that one out because it's super important to get first impressions), our own dev team, the private testers, and also feedback from partners, potential partners, or mentors. We are always looking at these sources of feedback, and it's important that the community keeps giving it. We can't design this thing in a black box. Our community has been great about speaking their mind. It is tricky though. A lot of players prescribe solutions to symptoms without conveying the symptoms. It's like walking into a doctor's office and saying, "I need to take antibiotics and 4 aspirin daily" without conveying that your leg is broken. There are lots of solutions to a given problem, but sometimes the problem is hidden by people jumping to their proposed solutions. We usually spend a significant amount of time digging into the "why" of the issue because there are real painpoints driving this feedback. Internally we have a pretty funny system to surface ideas: we have an "Idea Guy" channel where people can suggest their ideas. Sometimes they're silly or off the wall but occasionally there's actually something there that we want to develop further. We also have our regular design meetings where we hash out our design goals and plans for the upcoming builds. Whether the ideas come from internal sources or from the community, we treat them pretty equally. A lot of what we've built to date has been influenced by the community, and I know a lot of what's to come that we've got on our roadmap is influenced by the feedback we've collected from the existing players. Pre-Alpha and Alpha are great times for us to be prototyping and implementing new ideas, so I'm really grateful to the players who have supported us and jumped in early to shape the game. How do you view Kickstarter and early access backers? Are they 'shareholders', 'investors', 'knowledge base' or somewhere in between? Legally speaking, our existing Kickstarter backers and supporters from our website are not shareholders or investors (this is also conveyed in the Kickstarter EULA for all projects), but they are absolutely crucial to the success of Midair. These people are not your average players. They've committed their time and hard earned resources to making Midair happen, and we literally could not do it without them. That's not an exaggeration. I can't tell you where Midair would be without the community's help, but I can for sure tell you it wouldn't be where it is today. I follow a lot of indie games, and bar none we have one of the most passionate and dedicated group of early access supporters I've ever seen. Can you give me any examples of a community suggestion that made it's way through to the team meetings into production. After we announced the new turret types, SeymourGore suggested we combine all of our turrets into a single deployable that changes automatically when you're deploying based on the surface you deploy it on. That's one in particular we're looking to add in the near future. How did you select your first group of testers? 1. They needed to be good enough to break the game at a high level so we could fix those problems and design the game in a way that was resilient and fun for high level play. 2. They needed to come from a variety of backgrounds in the genre. We chose top players from Legions, Starsiege: Tribes, Tribes 2, Tribes: Vengeance, and Tribes: Ascend to join and give us feedback. These players put in a lot of effort and time in really analyzing the game in and out to help us reach our goals. This definitely paid off as we have lots of players from each game in the genre who are really enjoying Midair. Release is penciled in for December 2017, how are we looking? So far so good. We're moving quickly and about to hit our first major milestone on-time. That's pretty great for a Kickstarted game. Many already have lots of milestones delays by now. As we announced during our Alpha release stream, we decided to push back our Closed Beta release by a month in order to release on Steam Early Access around the same time. We'll of course push our final release when it's ready and not before then, but it's a good sign that we're making great progress early on.